The SuperWeb LLC group is infamous for developing numerous adware programs such as Primary Color, Knowledge Gains, Product Deals, and numerous others. 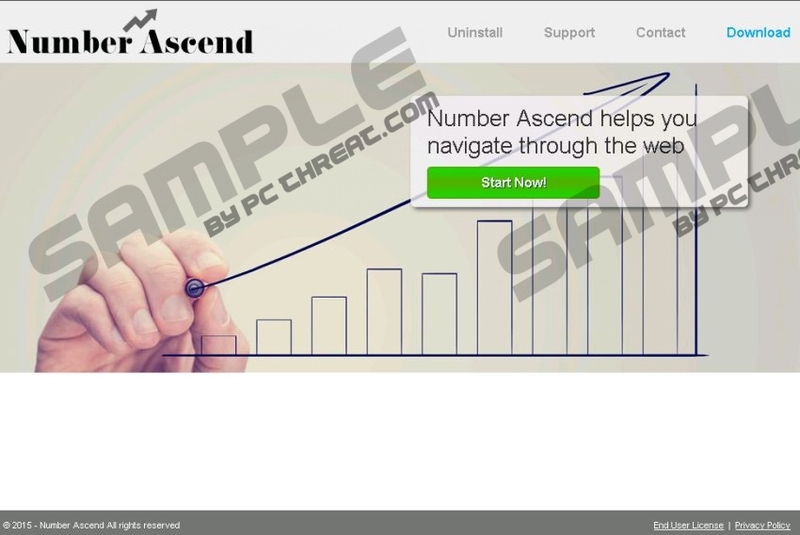 Number Ascend is one of the newest adware programs developed by this notorious group, and just like its counterparts it must be removed as soon as it is located running on your operating system. Even though, Number Ascend is advertised as a must have tool for helping you browse the web you should know that in reality it will not do anything like that. In fact, Number Ascend will only do the opposite as you will not be able to surf the web the way you are used to. Read the rest of this article and find out how Number Ascend functions and why its removal is crucial. Just like any other adware developed by the SuperWeb LLC group, Number Ascend will flood your web browser with useless third-party ads and pop-ups as soon as it gains access to your operating system. This activity is incredibly invasive and will cause endless annoyance and frustration as you will have to browse the web with a browser full of ads and pop-ups, which are utterly useless. This abnormal functionality of your web browser will continue as long as Number Ascend is active on your PC. In order to stop you will need to execute a thorough removal of this adware. Keep in mind that annoyance and frustration caused by Number Ascend is not the only thing that it does. In some cases, Number Ascend has been discovered to act in an entirely malicious way. We have noticed that some ads could be implemented with redirect links. This is an extremely dangerous instance as it is impossible to determine where you could get redirected. Often malware distributors use the redirect links as a tool to spread malware. For example, you could be landed on a website with an active arbitrary code execution exploit meaning that just entering such a website is more than enough to get your PC infected with some malware. Thus, you could end up with a system filled with various unwanted or even potentially malicious program without even realizing it. If you want to maintain a PC that is safe and secure at all times, removal of Number Ascend is a must. The removal of Number Ascend should be your utmost priority, as it is an application that not only holds no beneficial values, but could be quite malicious as well. Make sure to follow the removal guide carefully as just one mistake could mean that the infection was not removed entirely. This is very dangerous as it is known that other infectious programs could use leftover files or registry entries as a backdoor into your PC. This is why we strongly advise you scan your operating system with a professional antimalware tool once you have executed the manual removal. Right-click Number Ascend and then select Uninstall. Select Number Ascend and select Remove. Select Number Ascend and then click the Uninstall button. Quick & tested solution for Number Ascend removal.